3 to 4 Feet. Fragrant. Late July flowering. 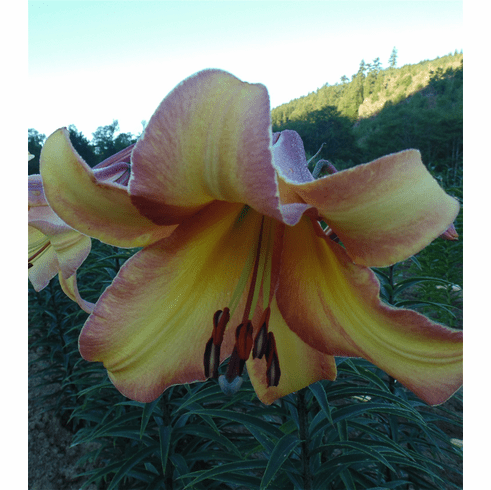 Sometimes there are no words to adequately describe the beauty of some lilies and this is one of those times. The base color of 'Rising Moon' is a luscious, understated, creamy pastel yellow. Highlighted with an equally understated pink, the petal trim on these flowers make them appear as if they were made of fine porcelain. Looking deep into the throat, you will find the absolute perfect choice for the shade of green that adds yet another bonus highlight. This flower is perfection. Blooms in July and should be planted in light afternoon shade in hot areas. 3 to 4 feet or more. The fragrance is as beautiful as the flower producing it. 'Rising Moon' takes a full year to really settle in after being moved and usually only produces 1 or 2 flowers the first season.